Without a doubt what best describes Bilbao is its atmosphere and its people. In every single street you will wander in Bilbao, you will find very affectionate, joyful and welcoming people, that gather in bars to have some pinchos, accompanied by a “mosto” or a good wine of the area at any time of the day. Certainly it is a unique city that is worth visiting if you want to know the North go Spain at its best. Additionally, Bilbao is considered one of the gastronomic jewels of the country, in which you will be able to taste dishes such as cod with pil pil sauce or baby squids in their ink. But what is also hard to ignore is the beauty of its streets, especially of its museums, which will for sure not leave you indifferent. So, without further delay, the moment has come to walk around the streets of the capital of Vizcaya. 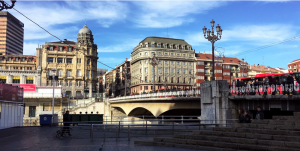 Right after my arrival in Bilbao, I headed to the heart of the city to visit its most known and visited symbols. First, I visited the famous Deusto University, one of the most prestigious universities in the county. Just by observing its exterior, I was fascinated by its façade, its structure and style, dating back to the XIXth century. 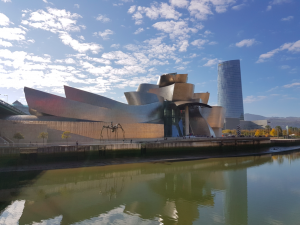 After my visit to the most known university of the area, only some minutes away by foot, at the other side of the river, you will find one of the monuments and museum most famous of Bilbao: the Guggenheim Museum. Its structure in titanium, with its curves and its dimensions are simply breathtaking and you will also enjoy of a very nice walk around its structure that leads you to Puppy. 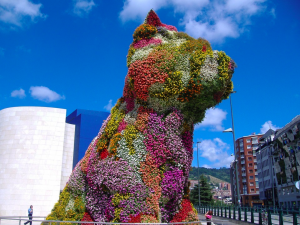 Puppy is a sculpture of a dog, an art piece by Jeff Koons, which height reaches the 12 meters. This structure is covered by natural flowers of all colours that make of the sculpture a complete masterpiece. Certainly, a picture you must take! Also, do not miss the other sculptures in the external back part of the museum such as the sculpture by the French artist Louis Bourgeois, that has the shape of a spider, which impressive dimensions will for sure cause a great impact on you. Without a doubt, it was worth it walking around the Guggenheim Museum to find these two famous pieces of art. The interior of the museum will not let down the high expectations that you will have built after seeing the museum from outside. Inside the Guggenheim, its permanent exposition is incredible, with paintings and sculptures of international artists and its temporary expositions have included works from Andy Warhol and Albert Oehlen. Waking up in such a beautiful city like Bilbao is a bit less hard, knowing that there are still so many things to discover. 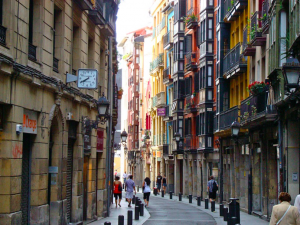 To kick off my second day in the city, I headed to the Casco Viejo of Bilbao. I started walking around the “seven streets”. Without a doubt, the best place to live the city’s atmosphere at gastronomic, commercial and historical levels. You will be captivated by the contagious activity of its streets and its citizens. In this area, you will be able to visit some unique historic symbols of the city. Among others, and surely my favourite, the Cathedral of Santiago. Declared World Heritage Site by the Unesco, it is a piece of art for both its external structure and its internal decoration, which constitutes a stop you must make in your tour around Bilbao. After a great lunch in a bar located in one of its main streets, I continued my visit around the centre of the city, since there were still a lot of spots and expositions I had to see in the area. My following stops were in the Church of San Antón, followed by a visit to the Archeological Museum of Bilbao and the History Museum of Bilbao; some highly recommended stops if you want to learn more about the origins of the traditions of its population. It is always very interesting to get to know a bit more about the history of the places we visit to better understand the dynamics of the city, its people and its traditions! Only two minutes away from the Archeological Museum by walk, you will be able to spend the rest of the day in one of the most popular squares of the city, la Plaza Nueva of Bilbao. However, if you still have some energy before finishing the day, its is highly advisable to go to the Basilica of Begoña, about fifteen minutes away by way from the Plaza Nueva. It is one of the most visited places in Bilbao, not only by foreign visitors but also by local inhabitants, since it is a very important symbol with high emotional worth for the local population. A highly recommended stop. And, what is the best way to wrap up by second day in Bilbao? To finish this intense day of tourism, I stayed in the Casco Viejo, sharing some pinchos, along with a good wine in some of the bars in the area. With the incredible atmosphere that arises at night in these streets, you won’t want the night to end! My last day in Bilbao had come (unfortunately for me) and there were still many places around the city that I still wanted to see. 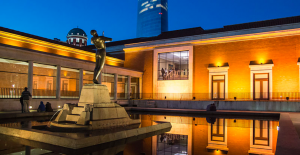 To start my day, I headed to the Bilbao Fine Arts Museum, which holds classic art pieces by very widely known artists such as El Greco, as well as sculptures by artists such as Eduardo Chillida. Without a doubt, a very recommended visit for the art lovers. After visiting the Museum of Fine Arts, I went to another main museum of the city, the Maritime Museum. An incredible museum that is composed of two parts: an outdoor zone and an indoor zone which will show you all you need to know about the history and the maritime history and traditions of this part of the country. A very interesting expositions that you just cannot miss. And to make your life easier and avoid long queues, the easiest thing to do is buying your tickets on advance thanks to your portable wifi device! For the soccer lovers, going to the San Mamés Stadium is a must! 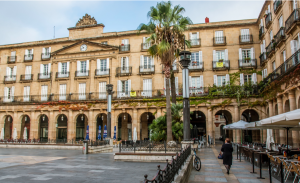 It is only fifteen minutes away by walk from the Maritime Museum or you can also use public transport to go there (stop San Mamés), which leaves you right in front of the stadium. It is one of the symbols of the city and the fans of the Athletic de Bilbao are widely known in Spain for being one of the most important and supportive fans in the country. My last stop was in the cultural centre by excellence in the city, the Alhóndiga. In this centre, there is a huge variety of things you can do and you will for sure not get bored there! You will find shows, activities, expositions and a sports centre among others. The best place to spend the last hours in the city! You can also get a guided tour around the centre or simply go by yourself and discover the different corners of the Alhóndiga! Sadly, my visit in Bilbao had come to an end, but I knew it wasn’t going to be my last time in this city. 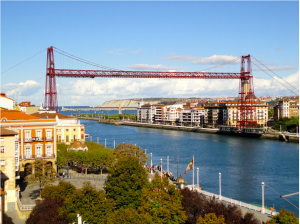 If you are lucky enough to be able to spend more days in Vizcaya, a great get away is going to visit the Vizcaya Bridge, declared World Heritage Site by the Unesco, that communicates Las Arenas with Portugalete. A very typical view that is worth seeing in person. After having seen it, the best thing that can be done is having a good dish of clams or fish in Santurce, after a very pleasant walk next to the river. Another aspect that makes me want to go back to Bilbao are its celebrations. The “fiestas de Bilbao” (or Bilbao celebrations), that take place in August, are one of the most popular celebrations in the country that fill the city with life, party, music and fun. If you go to Bilbao in August, it is without a doubt an event that you cannot miss! Bilbao is a city full of life, tradition and beauty that has become one of the touristic references of the country. A highly recommended visit if you come to the country. If you want to enjoy everything that is going on in the city at its fullest, do not forget your portable wifi device in Bilbao to get the most out of your stay in Bilbao!